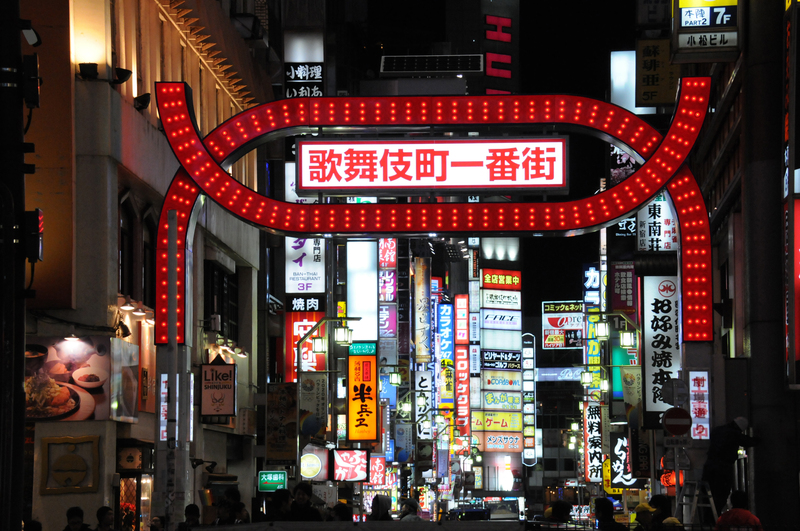 As an ancient culture, Japan has plenty of scope for the imagination when it comes to crime writing. You can pick and choose among tales told from times spanning a thousand years. My forays into Japanese crime fiction began in the very recent past. 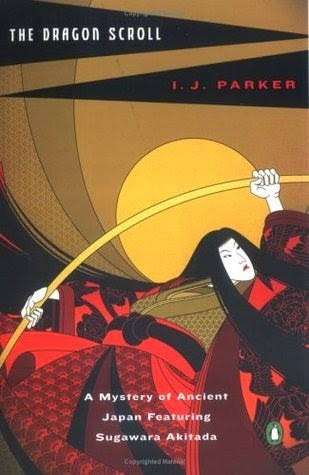 I started with I. J. Parker's Sugawara Akitada mysteries. The Japanese custom is to place the surname first because it honors the family rather than the individual. Akitada was 25 years old and a junior clerk in the Imperial Ministry of Justice. He had won this position because he was an excellent student and had come in first in the university examinations. While he was a nobleman of the famous Sugawara clan, times were tough and he was excited to be given this job. The series begins with The Dragon Scroll, which takes place in the year 1014. Akitada's first mission was to investigate missing tax shipments from cousins in a distant province. 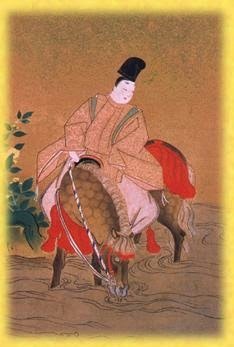 This excited him, because this was his first journey away from the capital, Heian-kyō, modern Kyoto. He was also fortunate to be traveling with an old family retainer, Seimei. This elderly man was Akitada's mentor and he was skilled at many things, including herbal medicines, and had deep knowledge of Confucian teachings. Traveling the Imperial Highway was unsafe at the best of times, and it wasn't long before Akitada was attacked by a couple of thugs. It was his good fortune to be rescued by Tora, an ex-thug himself, who became a permanent part of his entourage. 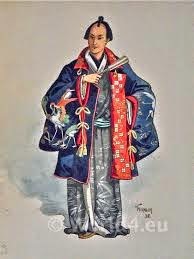 Akitada was never ambitious enough for his mother, but he had a knack for solving crimes and the authorities, from the emperor on down, appreciated his skill. There are 13 books in this series. Akitada is inquisitive and intelligent, and his skills are in constant use as he unravels mysteries found in peasant hovels as well as the rarefied atmosphere of the Imperial Palace. He is a decent and honest man and he maintains adherence to the strict social codes of ancient Japan. Naturally, all of the events in the series are imaginary or fictional, but the system of law enforcement, the educational methods and the customs and tastes of 11th-century Japan bring authenticity to the stories. These books are sprinkled with beautiful illustrations that resemble Japanese woodcuts. As an extra fillip, there is at the end of each book a brief historical endnote that enlightens the reader about pertinent aspects of life at this time. 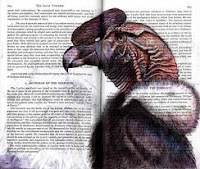 I. J. Parker is a retired professor of English and foreign languages and won the Private Eye Writers of America (PWA) Shamus Award for Best P. I. Short Story in 2000 for "Akitada's First Case." On my TBR and not too dusty is a Laura Joh Rowland series that features Sana Ichiro, a samurai who investigates matters for the shogun. It gives a taste of what life was like for the Japanese in the 1600s. 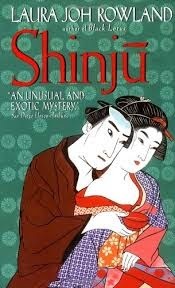 The first book, Shinju, takes place in Edo, a city destined to become Tokyo in later years. It begins with a double death involving a commoner and a beautiful noblewoman. Is it a typical shinju, a ritual suicide, or something more? Ichiro is a reluctant investigator. He prefers teaching, but he can't let the case be hushed up. Another reluctant sleuth who would rather be teaching is Kyosuke Kamizu, nicknamed "boy genius," an assistant professor at Tokyo University. He makes his debut in Takagi Akimitsu's The Tattoo Murder Case. This case takes place almost a century into the future, during the American Occupation in the late 1940s. All that is found are severed limbs in a locked room. Miss Kinue Nomura survived World War II, only to be murdered in Tokyo, her severed limbs left behind. What is gone is that part of her that bore one of the most beautiful full-body tattoos created by her late father. Kamizu doesn't wear a deerstalker hat, but his approach to solving this crime is very Sherlockian. Just as interesting about the unusual case is the description of the culture that revolved around art tattoos. Despite the fact that Japan was occupied by US troops at the time, there was only one small mention of the military, as if it didn't really impinge on the routines of the ordinary folk. 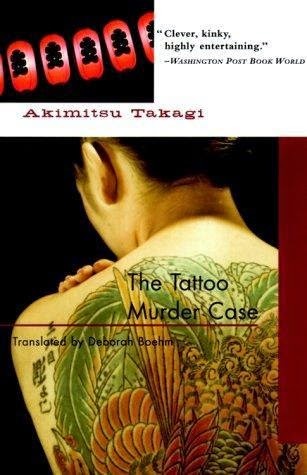 The Tattoo Murder Case was originally published in 1948, and Takagi Akimitsu followed this by many books, most of which remain untranslated. Even though Kamizu was well liked, most of the books usually feature prosecutors or police detectives. Seicho Matsumoto wrote his series in the late 1950s and early 1960s. As in his Inspector Imanishi Investigates, the plots focus on human psychology and ordinary life rather than intricate puzzles. The central character is Inspector Imanishi Eitaro, a more typically Japanese detective, fond of gardening and haiku. A corpse felt to be from the provinces is found under the rails of a train in Tokyo Station. The subject of Imanishi's investigation is not only the crime, but also the society in which the crime was committed. Matsumoto brings up the subject of police corruption, which was a new feature of Japanese crime fiction. James Melville's books feature Tetsuo Otani, the superintendent of the Hyōgo Prefectural Police. Otani frequently runs into people who are afraid of the police because of their history of strong-arm tactics over the previous decades. He is constantly reassuring everyone that the police are not what they were, but it's a struggle to get cooperation from the general populace in solving crimes. For the most part, these books take place in the 1970s and '80s, when murder was uncommon in Japan and was usually related to gang warfare or domestic violence. 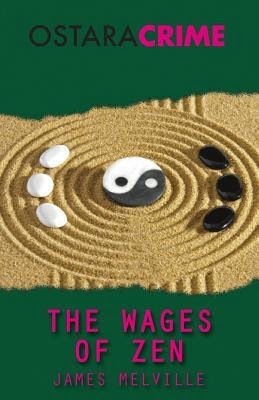 In the first series book, The Wages of Zen, Otani is called to a murder case while he is attending a Rotary dinner. This is but one example of the western influences during these years. 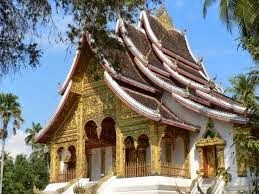 A body has been found in a local temple, which is apparently also a foundation for East-West understanding. This is an unusual case, where all the suspects, as well as the victim, are foreigners who had come to spend time at a local Zen Buddhist temple. Otani joined Hyogo police during the postwar American occupation, and he was aware that policing had changed more than many other things In Japan. It is amusing to read about the convoluted ceremonial courtesies governing most interactions. Melville depicts everyday Japanese life nicely, and he describes Japanese society morphing from strict traditionalism to a relentless drive to modernization. Otani has a team of colorful and streetwise detectives who spend most of their time confronting organized crime and political duplicity. Otani himself does not speak English, and he depends on his team to help him understand the foreigners among whom there is a killer. In Sujata Massey's series, we meet Rei Shimura, an underpaid English teacher in Tokyo in the late 1990s who wishes she was doing something better with her life. You can read about her here, here and here. Arimasa Osawa writes another series that is very popular in Japan. 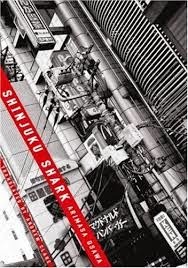 These books were written in the '90s as well, but although Shinjuku Shark, the first of many, won several prizes, it wasn't translated into English until 2008. The central character in these mysteries is a complete turnabout from the traditional detectives I've just mentioned. He is Samejima, who goes by the nickname "the Shinjuku Shark." He is a maverick detective who has no friends in the police or the main Japanese bad guys, the Yakuza (organized crime syndicates), because he refuses to turn a blind eye to corruption. This leads to increasing isolation from the police force and he usually works alone. Osawa describes an uneasy peace between the Yakuza and the police. The Police Organized Crime Department is known as the Marubo, and it kept a close watch on the Yakuza clans. The Yakuza usually didn't go out of its way to become involved in small disputes. It is all bound up with the concept of honor among men and the result of returning favors and a give-and-take granting the other face-saving concessions. Samejima detests the Yakuza and he dislikes the way police officers fraternize with them, so he keeps making a nuisance of himself by going after any punk, regardless of his ties. It is no surprise that Samejima's career is stalled and he is relegated to the crime-ridden streets of the Shinjuku district. His street name came from his reputation that once he gets his teeth into somebody he doesn't let go. When an elusive sniper begins targeting police officers in his district, Samejima sets out on his own to find the man responsible, no matter who he is. This is a rapidly paced noir entry that is gritty and realistic, although it is somewhat surprising that as much as Samejima is detested, he escapes the sniper's crosshairs. Samejima is still solving crimes and chasing the Yakuza in Osawa's most recent book translated into English, The Poison Ape. The Devotion of Suspect X by Keigo Higashino is a more recent Japanese crime sensation and is mentioned here. 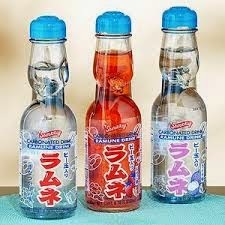 So pour yourself some sake or grab a bottle of Ramune (a carbonated beverage of exotic flavors that comes in a tricky bottle that uses a marble as a stopper) and settle in for a trip through time. Or flip that remote to Ninja Turtles reruns and be very grateful if your children or grandchildren aren't using them as role models. As John Wayne would say . . .